Leading Manufacturer of acrylic fabrication works from Chennai. 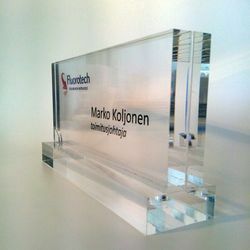 Our unique capabilities allow us to produce the finest imaginable Acrylic Fabrication Works on different hard surfaces. The fine quality and clarity in the acrylic works depicts the professionalism and the traditional craftsmanship of our designers. Graphic composition and typography forms an important part of acrylic works and we have the facility to incorporate the same in the final work.